CONWAY — Democratic presidential hopeful Hillary Clinton gave UFO enthusiasts a reason to cheer at the close of her recent editorial board meeting with The Conway Daily Sun. Right: Reporter Daymond Steer asks Democratic candidate Hillary Clinton for her stance on UFOs when she visited the Sun on Tuesday. (MARGARET McKENZIE PHOTO)During the meeting, the former first lady, former senator from New York and secretary of state answered serious questions about foreign policy and the economy, and at the end, she chatted with this reporter, who had asked her about UFOs the last time she visited. She recalled that 2007 exchange with a smile and seemed to have fun discussing the topic. Last year, Bill Clinton told late-night TV host Jimmy Kimmel that he wouldn’t be surprised if Earth is visited by aliens since so many planets out there may support life. “I just hope it’s not like ‘Independence Day,'” said Clinton, referring to a movie about alien invaders. Clinton also said she would like to look into Area 51, a secret military base in New Mexico that has long been rumored to contain aliens. At first, she called it Area 54 and then corrected herself. But Bill Clinton told Kimmel that he had already looked into Area 51. He said everyone who works there has to stop about an hour away to put on special clothing. Clinton said Area 51 is where stealth technology is made. “There are no aliens there,” said Bill Clinton, adding at the anniversary of the supposed Roswell, N.M., crash in 1947, he released all the documents he could on the subject because he knew there would be popular demand. Kimmell had Bill Clinton promise that he would have announced the existence of aliens if he had found them. Hillary Clinton, while at the Sun, added that the chairman of her campaign, John Podesta, is a huge fan of UFO lore. She said he enjoys a sc-ifi show on the FX network. Podesta served as chief of staff to Bill Clinton and counselor to the president for Barack Obama. This interview of Secretary Hilliary Clinton, represents a breakthrough moment in American political history. Twenty three years after her husband’s administration was engaged by Laurance Rockefeller to release all “UFO” documents in government files and grant amnesty to government witnesses (the Rockefeller Initiative), Secretary Clinton has finally spoken to the extraterrestrial presence issue while campaigning in New Hampshire. When considering this reportage it is essential to remember she had the option to speak off the record. Here is a breakdown of and background on this interview. [Steer] During the meeting, the former first lady, former senator from New York and secretary of state answered serious questions about foreign policy and the economy, and at the end, she chatted with this reporter, who had asked her about UFOs the last time she visited. She recalled that 2007 exchange with a smile and seemed to have fun discussing the topic. Throughout 2007 PRG worked to bring the Rockefeller Initiative into the presidential campaign. For example, PRG executive director Stephen Bassett was interviewed on Fox News on July 5. This effort failed to draw out Senator Clinton, but may have helped to generate questions asked at the October 30 Democratic primary debate in Philadelphia of Congressman Kucinich, Senator Obama, Governor Richardson. This is interesting as PRG was not aware of this statement. It is likely true and worth noting that Canadian researcher Grant Cameron was behind many of those presidential records requests. It also true the UFO/extraterrestrial issue accounts for the largest genre of FOIA requests throughout the Act’s entire history. [Steer] Last year, Bill Clinton told late-night TV host Jimmy Kimmel that he wouldn’t be surprised if Earth is visited by aliens since so many planets out there may support life. PRG has publicly stated the appearances by President Clinton on the Kimmel and Colbert Shows and President Obama on the Colbert Show were not random, were coordinated, and in response to PRG’s Congressional Hearing/Political Initiative. Secretary Clinton’s response to Steer was extremely strong. No president or presidential candidate has ever made such a statement. [Steer] Clinton also said she would like to look into Area 51, a secret military base in New Mexico that has long been rumored to contain aliens. At first, she called it Area 54 and then corrected herself. This is a remarkable statement. 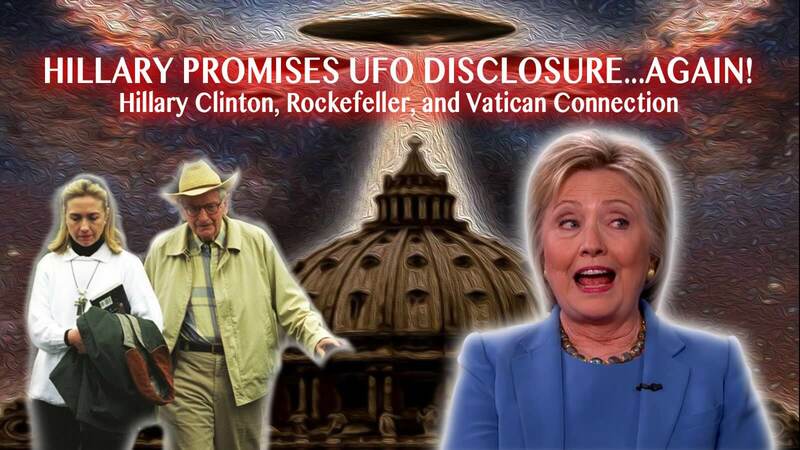 Secretary Clinton has just informed the Pentagon, which is quite aware of the Rockefeller Initiative and the Disclosure advocacy movement, she is heading their way if elected! [Steer] Kimmell had Bill Clinton promise that he would have announced the existence of aliens if he had found them. By openly referring to Podesta in this context she has linked her campaign to his recent twitter statements, his calls to release the UFO files, and ultimately his role in the Rockefeller Initiative. She also played a role. By doing this she is making clear Podesta’s tweets were not jokes. This is important. This is very strong. Podesta was on the White House payroll as an advisor to Obama throughout 2014. This statement by Clinton would seem to again confirm the Podesta regret tweet was serious and indicate Podesta may have in fact advised Obama to seek the release of the UFO files to no avail. Was President Obama, as with President Carter, denied information by military/intelligence sources? If true, this would raise a significant constitutional question? Conclusion. PRG’s analysis of events has not changed. John Podesta is the key advisor and strategist behind the inside political Disclosure process, Secretary Clinton will be the messenger, and Barack Obama will be the Disclosure president. What should and must happen next is for top tier political reporters to ask Secretary Clinton and John Podesta detailed questions regarding the Rockefeller Initiative.